As a parent at Christmastime, I am more fortunate than most. My family lives in the Buddhist country of Cambodia, so we get to miss most of the commercialization of Christmas. Christmas isn’t even a day off here. But still, we sit at home on the 25th with our coffee cake and stockings in the tropical heat while our neighbors go to work and school. No matter where we live, many of us are searching for new wineskins for the traditions we have inherited. Being in another culture and not having television has given me the opportunity to re-frame and rediscover the traditions that make up my faith without distraction. In the West, Christmas is a season fraught with empty sentimentality and traditions whose roots have been lost in time and eventually co-opted and commercialized to serve the goals of consumerism. But in Cambodia, I have space to sort through the intersection between my faith and the culture in which I grew up, and I can more intentionally choose with what traditions I will raise my kids. As a child, I greatly enjoyed the anticipation of Santa Claus and the delicious agony of trying to stay up all night to catch a glimpse of reindeer. But as an adult, I struggled with whether I wanted to go down that road with my own kids, laden as it is with Coca-Cola ads and an emphasis on presents over the gift of God’s Son. Santa as we know him today feels so far from the baby born in poverty, who became a refugee in a politically violent age and a fragile, yet powerful, hope for a dark world. My indecision on the whole Santa thing led to me do a little research—my very own quest for the historical Santa. Santa, or rather Saint Nicholas, was a real person, though it takes a little digging to sort through fact and fiction and figure out from which specific person he was actually derived. But as far as I can tell, the real Saint Nicholas is worth telling our kids about—more so, I would argue, than the overweight director of toy distribution working out of the North Pole that has evolved over time. 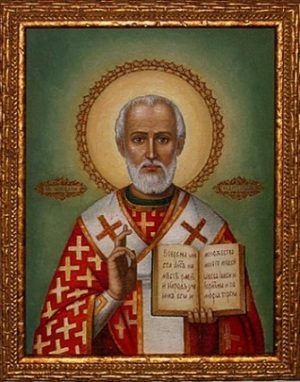 The original Saint Nicholas was a bishop from Myra in Asia Minor (today Turkey) around 300 AD. His parents died when he was young, and he gave away all his inheritance to help the poor and sick. He was also imprisoned for a time when the Romans were persecuting Christians and capturing Christian leadership, but was released when the Emperor Constantine politically legitimized Christianity. The legend of Santa Claus came about when Bishop Nicholas decided to help a widower who had three daughters. The widower couldn’t support his daughters, and the girls didn’t have dowries, He felt the only way to save his family was to sell them into prostitution. Nicholas heard of this, and remembering the biblical value of giving in secret, left a bag of gold under the cover of darkness to provide for the dowry of the first daughter. When the second came of age, he left another bag of gold, and then once more for the third. Some say that he threw the bags of gold down the chimney. Bishop Nicholas also helped free three innocent men from execution. The governor of the area had accepted a bribe to imprison and execute them, but when Nicholas found out about it, he physically halted the executioner before verbally upbraiding the governor until the governor confessed and repented. The men were set free. Until recently, Saint Nicholas was remembered as a man who was generous to the poor, prevented human trafficking, and stood up against injustice in the name of Christ—all values that, I believe, are close to the heart of Christ, and values that I would love my children to embrace as they grow. The true story of Santa may be one worth telling after all. Justice and mercy in action are far more compelling than sentimentality any day. As we sift and sort the historical mishaps and debris that have collected around our important faith celebrations, we can bring new life to some traditions, discard some entirely, and in others, like that of Saint Nicholas, we may be able to rediscover with the light of truth.